Here's a video that is uncomfortable to watch on two levels. The first is that I feel terrible for Brian Ambrozy, the editor-in-chief of Icrontic, who is appearing on Fox News to try to explain why and what kind of video games are now eligible for federal arts funding. The second is the nonstop assault Fox and its counterpoint ringer make on one's intelligence. Only an idiot would say that Call of Duty is eligible for a grant from the National Endowment for the Arts. Only an idiot would believe it. 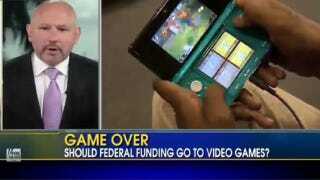 Only an idiot would believe the government is giving tens of billions of dollars to video game development, as Fox insinuates. But all this makes for good video and outrage in the nursing homes where Fox News' weekend programming has its highest penetration. So off we go, even when Ambrozy points out that giving taxpayer money (notice how many times they say that) to a major commercial release is about as likely as Michael Bay getting a grant for the next Transformers movie. Then comes something named Neal Asbury with a counterpoint that, in structure, resembles the Chewbacca defense. Which is to say he wasn't even paying attention while Ambrozy spoke. I'm not sure who Asbury is or why he's even qualified to talk about federal arts funding or video games. At least the latter is the subject Ambrozy deals with as part of his job. Asbury seems to be nothing more than a weekend pinch-hitter from Fox's rolodex of drive-time radio demagogues. Neither he nor the host are interested in what's being said, only what they're saying. Ambrozy does get in a good dig—"I'm talking to entertainers here"—but he never had a chance. He deserves respect (if not sympathy) for taking the very thankless role of presenting the gaming-as-art point of view for a program that had no intention of treating it seriously. That said, I have to wonder why anyone would agree to appear on Fox News as an advocate for any subject to which the network is so recognizably hostile.